Neven Dayvid is a would be poet hailing from Germany. His music is a strange mix of Drum & Bass orientated stuff overlaid with his insane poetic rantings. He is joined by Dal Martino - Bass, Tim Tabeling - Electric Guitar, and Greg Core - Drumming. Wu Wei makes an appearance playing a Ba Wu Flute on the track ‘Hinterland’. 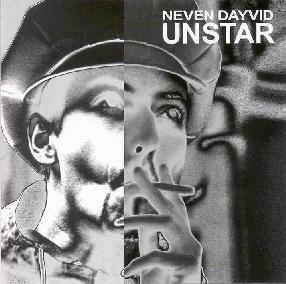 Unstar is a twelve track CD lasting just over sixty minutes. Its style is set firmly in obscure sound creation, its vibe moving over several different genres ranging from the heavy to the mellow. All compositions have that Drum & Bass, Breakbeat sound, and most tracks have relentless spoken word reaching out with angry tones. Certain aspects of the heavier stuff like ‘Balaclava Baby’ reminds me of Ministry, as well as 1980’s English electronica, Depeche Mode springs to mind. There is a varied approach to the compositions. Some are very spacey, ‘The Desert is Me’ being one such track. It glides one paced but it is a hypnotic pace. It gradually builds to evolve into a heavier motion, suddenly lapsing back to the hypnotic again. The layers of sound throughout are haunting and they bring slight lapses into the progression of the album, allowing the more chaotic elements to stand firm in the mix. Unstar is a well produced CD. It is reliant on the listener’s patience, if you can handle Drum & Bass type beats you are half way there. If you cannot it will do your head in. The whole vocal ranting thing is set in its own discord. The words are meaningful and subject to sadness abstracted by a nagging voice within. You’re feeling like a broken flower that will spiral slowly to the ground, where now, where to go? Suppose we have all felt like that eh? ‘I Wanna Be Your Ashtray’ again brings slight tones of Ministry with it as it jumps back and forth between quiet and hectic. It is good to see that all instruments are played and not just stolen from other people’s work. There are too many of these sample-orientated bands which are really one person and a computer. At least Neven Dayvid has acquired musicians to perform the parts.